Come home to Roost. We welcome you to this health-focused café and pantry, in the heart of the Surrey village of Bagshot. Roost believes in bringing you homemade, nutritious and clean-eating options for breakfast, lunch, snacks or meeting up with friends. We aim to bring you healthy, nutritious food that doesn’t compromise on taste and indulgence. Roost looks to build awareness and attention on how the food we eat can impact our health and well-being. It can be frustrating that better quality food comes at a greater price, but we feel the health benefits of real food far outweigh the cost. The Cafe offers a diverse range of meals, snacks and treats, catering for everyone, including diets that are gluten-free, dairy-free, unprocessed and naturally sweetened. 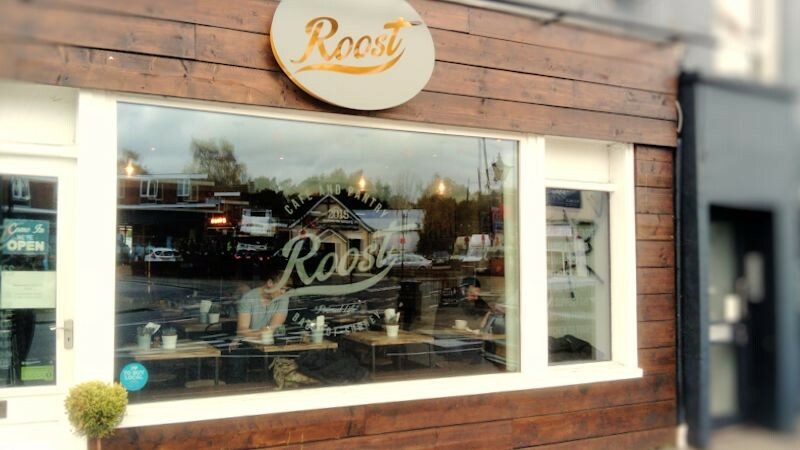 With everything in store being gluten-free, Roost is ideal for Coeliacs, autoimmune conditions, IBS and more. Roost believes in primal-inspired living – eating foods that suit individuals. We offer organic, pastured-raised whole milk with our locally-roasted coffee, or dairy-free alternatives. We offer specialty organic teas and locally-roasted specialty organic coffees, herbal infusions, and a wide range of health conscious cold beverages, like Kombucha, to support immunity. We bring you freshly prepared, seasonal dishes for you to enjoy with us, or on the run. Let us tempt you with our range of baked goods, cakes, biscuits and nibbles for light snacks, all following the principles of the primal-inspired lifestyle. Large cakes in a variety of sizes and flavours are also available for birthdays and special occasions by pre-order.